Designed to help you learn about the correct belief, how to purify, pray and fulfil other such Islamic obligations. 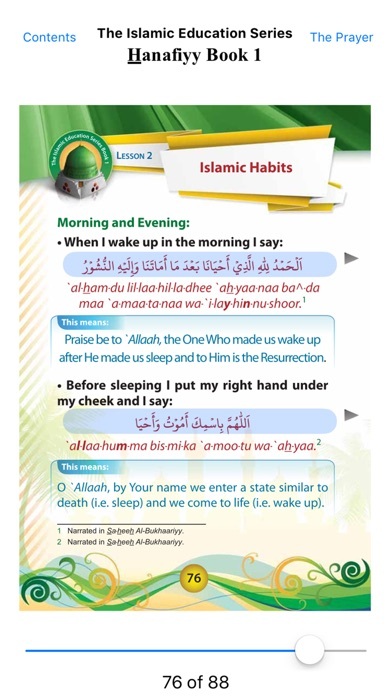 The app is based upon The Islamic Education Series Book 1 in the Hanafiyy Madh-hab. The Islamic Education Series is a collection of 5 books for children and beginners seeking to learn the personal obligatory knowledge of the religion that all Muslims are required to learn so as to be safe in the Hereafter. The teachings within them are all in compliance with the teachings of `Ahlus-sunnah Wal-Jamaa^ah. These books are available in the Hanafiyy and Shaafi^iyy Madh-habs in various languages, including Arabic, English, French, German, Turkish and Urdu. Each book is divided into three parts: Islamic Belief, Acts of Worship and Islamic Manners. The Islamic Belief Section covers the correct belief in `Allaah, the Prophets, the angels, the revealed books, the Day of Judgement, paradise, hellfire and other such basics. The Acts of Worship Section covers details of how to purify (ghusl and WuDoo`), pray (Salaah / namaaz) by oneself and in congregation, how to fast, give Zakaah, perform Hajj and other such matters. The Islamic Manners Section covers good treatment of one’s parents, the mosques and of people around one, both young and old. Islamic Manners covers good treatment of one's parents, the mosques and of people around one, both young and old.